We’re so confident that you and all your guests will have such an amazing time when one of our DJs comes and rocks your party that every Showtime Events booking comes with our ‘Good Time Guarantee’. For some clients our standard package is plenty enough for them to handle as it is, but others do feel the urge to pump up their package and book one or two of our specially tailored extras. One of the simplest and most cost effective ways to transform even the dullest ceiling in any venue. These can be intertwined with white fairy lights to create maximum effect. We can also supply these in over 60 colour shades ensuring complete continuity with the rest of your scheme. Our ceiling swags and drapes are available in widths from 1.5m to 3.0m ensuring a fuller look and substantial coverage. 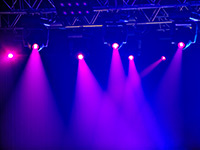 A cost-effective option to turn your venue vibe from glam to gorgeous is to use our special designed uplighting packages to enhance your party space. These are often used throughout the event to colour match with a theme and then later in the night they can be used to completely change the feel of the evening too by being switched into a colour-changing mode. They’re guaranteed to make your event stand out from the crowd! If you’re looking to pep up your party space a little but are conscious of the budget, then one of our starlit backdrops might work for you. This low cost extra can be used to instantly jazz up your event space and provide a perfect setting for the party people! Available in a range of colours and sizes, these twinkly miracles really give plenty of bang for their buck and they can be set-up really quickly too so they can be put in at the time when your function room is being refreshed and be ready for you to hit the floor straight after! 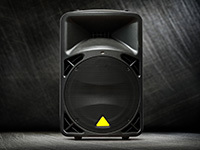 Most of the wedding & party clients we have nowadays grew up in the clubbing era and are used to seeing larger lighting systems and moving lights and want to bring a little of this to their function too. No problem at all! At Showtime Events we have a whole range of extra lighting eye candy that can be added onto your package to bring the high energy club vibe to you. Think elegant sweeping patterns with strong colours all moving & changing with the music and you can’t go wrong! Please contact us for more details. Ok, so we’ve all been there. You’re at a fantastic summer wedding enjoying a few drinks with your friends in the warm evening breeze and then the DJ gets you all inside for the first dance! Annoying right? 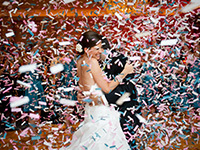 Well here at Showtime Events we can bring the first dance to you. Talk to us about booking an additional outdoor PA system for that memorable al fresco moment. Remember, everything is possible when it’s Showtime. 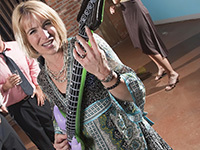 Often clients ask us about playing background music during the dinner, but we think that’s an expensive way to do it. Afterall, why pay for all that extra time when you can hire one of our portable PAs to do the job. It comes all prepared with four hours of dinner music, an input for your iPod or tablet & even a radio mic for speeches! Just the job. Often booked in tandem with a portable PA hire, we are sometimes asked to help with the preparation of specialist ceremony or background music for wedding breakfasts or black-tie dinners. Just tell us what you’d like and in what order and we’ll do the rest. Then just find a reliable person to press the right button at the righ time and you’re good to go! 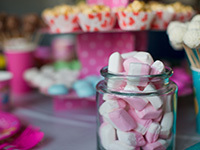 A little different from the more usual bridal-style candy cart, we decided to take our buffet in a Pick & Mix direction, maximising the amount and variety of sweets to choose between. Our buffet includes 25 varieties, with a dedicated server to assist all your guests for up to three hours, with everything wrapped up in our striped candy bags. If you’re struggling to remember what it felt like when you were ten years old, trust us this will help! What’s not to like? When it’s Showtime, everything is bigger & better and our chocolate fountains are no exception, in fact, here huge comes as standard. 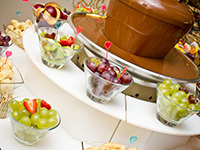 Chocolate fountains are popular at all events, but work best at teenage parties, bar mitzvahs & wedding receptions and look best on our LED colour-changing base. Our team will help your guests with all the fruit, goodies and chocolate they can eat for three hours and even leave you a doggy bag for after! Go on, have some more, no one’s looking! 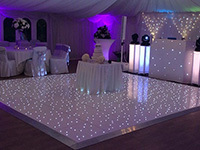 How about a twinkly LED dance floor to really set the tone for your romantic first dance or uber-cool corporate event? 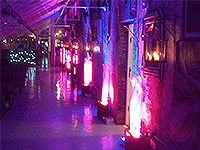 Our floors come in a range of colours & sizes to fit any budget or venue. So whether you want it in white to enhance your wedding wonderland or in black to add some cocktail chic to your charity fundraiser, we have the floor to make your toes twinkle! Give us a call. What better way to snap all that party crazy as it happens right there in the room than with your very own ‘Capture Cabin’ a Showtime Events special. Our Cabin hosts will tempt you & your guests in with a quirky array of fancy dress items, to ensure the pics really capture their antics on the night! 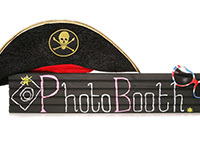 If you’re organising a school prom, why not build a Capture Cabin yearbook from the snaps, rather than the usual one? Trust us; it’s the only way to remember the best years of your lives. Call us now to boost up your package. Just into stock is our latest party trick that will wow all your guests! 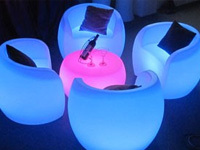 Why not add some nightclub cool to your evening function by booking a few pieces of our colour-changing furniture. Think about adding our illuminated poseur tables, coloured seating cubes or our very cool champagne buckets to set the tone for your uptown funk! The only thing you need to decide is what colour to set them on! If all of the above wasn’t enough, then the crowning glory to your BIG bash will surely be our ‘Craic In A Box’ party kit. Add a dash of crowd-pleasing party inflatables to a shot of fancy dress gear with a measure of MJ’s hat & glove and serve over party poppers & streamers. Just add guests and stir! Amazing. It’s guaranteed to make your event stand out from the crowd! Promise. Remember, it’s all possible. Once you’ve had a look through all the options, just let us know what you’d like to add on to your package and leave the rest to us. It’s a good time guaranteed! Contact us to see how we can help you. It’s a good time guaranteed. Just a note to say thank you again for being part of our special day. You were a massive part of making our day perfect and we are so glad we chose you to help us celebrate in style! I would like to say thank you for our disco you provided in our wedding. Everybody really enjoyed it (the bubbles were fantastic!) and had a great time! If I need disco services, I’ll definitely call you. Thank you again! Thank you so much for being our wedding DJ! We had an amazing day and couldn’t leave the dance floor…everyone loved the music! Thank you so much for the wonderful disco you provided for our wedding at Tewin Bury. We had the best party and the music was just right, in fact Ben has never danced so much! Everyone commented on how great it was to want to dance all night. 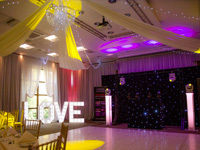 We just wanted to say thanks again for our wedding reception disco, it was absolutely fantastic! All our family & friends commented on how good the music was and how well it went. Thanks again for making our reception truly memorable, it was a lovely way to complete our special day. We just wanted to say a big thank you for being such a great DJ! Even though we couldn’t get you started as early as we’d planned (Sorry! ), you really kept the party going and we, as well as all our guests, had a fantastic time! 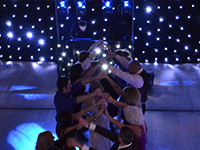 We are a party production & event management company based in Hertfordshire that really focuses on what we do best. 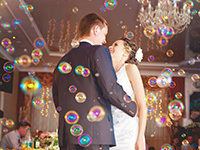 That is, DJ-based entertainment for discerning wedding and top-tier corporate event clients. We really are DJ entertainment & event specialists, as you will see from the many client testimonials all across our site. © 2019 Showtime Events & Drapes. All rights reserved.